What a treasured three weeks we have spent together. My heart is sad that we have reached the end of our journey. How I wish I could hug each and every one of you and spend time together sharing all that God has done face to face. You have been so faithful! This journey through the lives of Mary and Martha has challenged all of us, and you have been faithful to meet that challenge head on. You persevered even when it was hard. I’m so proud of you!! And you can be assured of this: God will richly bless your faithfulness. I know there are many places you can invest your time on-line. Thank you for choosing to invest your precious time in this study and with me. I’m so thankful for each and every one of you! Before I jump into the closing message, I wanted to share some exciting news with my favorite On-Line Study girls! Thomas Nelson shared the release date for my very first Bible Study! 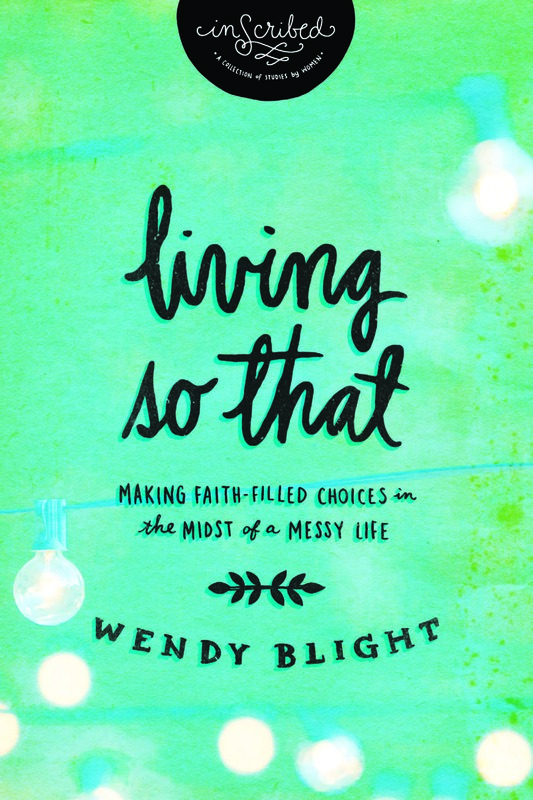 Living So That: Making Faith-Filled Choices in the Midst of a Messy Life will be released in March 2014!! Thomas Nelson sent me the cover a few days ago, and I want to share it with you! Living So That will be part of Inscribed, a new collection of books offered by Thomas Nelson. The books will be written by a community of women authors who have a deep desire to get women into the Word in a way that makes it understandable and equips them to take that Word and apply it in everyday life. The logo at the top of the cover identifies the book as being part of The Inscribed Collection. I would love your thoughts on the cover and this new collection by Thomas Nelson. Leave a comment, and I will choose two names to receive a free copy of Living So That when it arrives hot off the presses! If you want to team up with me for pre-release activities, please sign up for Wendy’s Street Team by clicking here. It will be a fun group who will have the inside scoop on all things Inscribed and get extra special perks. Now that we have a publication date, we have some exciting plans that we will share with the Street Team in the next few months. The Team will get to read a chapter before Living So That is released, learn about the new studies being released in the Inscribed Collection before anyone else, get sneak peaks at the Inscribed Website before it’s officially launched, and participate in fun giveaways all along the way. I hope you will sign up and join us for this exciting time!! Okay, back to our study. Below please find a closing message from my grateful heart. Now that our study is over, it’s time to continue our journey of sitting at the feet of Jesus. We often start with the best of intentions but fail because we don’t have a plan. We start with so much enthusiasm and excitement and within a few days, life gets in the way. Good things push out our time with the Lord. Here are three ideas to help you be successful in keeping quiet time with God a priority in your heart and life. Set a goal, one that you know you can keep. Maybe you do better moving through one book of the Bible at a time so choose one, work through it faithfully and when you’re finished, celebrate and choose another one. Maybe you do better with time. Choose a length of time you will sit with Jesus and His Word. For example, the first week, begin with five minutes and focus on a few verses at a time using the book of Psalms or the book of Proverbs. The next week or month, bump your time to 7-10 minutes. The next week or month 10-12 or whatever works for you. You get the idea. Find a time of day and a place that works for you. We talked about morning being best, but if you can’t, remember there are no rules. Maybe lunch is better for you or nap time if you have children or bedtime if you are a night owl. What matters is to find what works in your schedule so that you will do it. And find a place that you feel comfortable and won’t be disturbed. When I first started my quiet time, I sat on the floor in our walk-in-closet and loved how quiet and private it was. Maybe it’s curled in your bed or in a favorite chair on your porch or at your desk. But whenever and wherever it is, make it a place you love to go. Keep your Bible, journal, a favorite pen, a blanket, and whatever else you love. By this I mean, decide what quiet time is for you. It will be different for everyone. Maybe you want it to be a time of journaling prayers and listening for the Lord as you pray. Or maybe you want to use it more as a study time to work through a book of the Bible and seek to know God in deeper and richer ways. Maybe you want to use it for a time of praise and worship. Sweet friends, that is what is so great about our God. Do whatever it is that God leads you to do and then be consistent in that. After a month, maybe you can vary what you do. Next, I thought I would share an example of a 7-10 minute quiet time to get you started. Spend a few minutes reading from the Word (Scriptures or devotional book). Maybe a chapter a day if you are reading the Bible. If you use a devotional, dig beyond the day’s reading. Usually they include Scripture references or ask questions that require a response. Look up the verses and look up cross-references. Answer the questions. Note them in your journal or notebook. And if you can’t finish what you commit to read, NO GUILT or CONDEMNATION. Just pick up and read the next day. Satan wants you to feel like a failure and unworthy. Don’t believe His lies. Don’t be afraid to use a pen or highlighter, noting verses where God speaks to you, touches and/or convicts your heart, answers a prayer. Write what you learn and/or hear from God. Praise God for His greatness, power, majesty, love, faithfulness, and holiness. Specifically confess your sins before the Lord. This cleanses your heart and allows God to hear your prayers and work in and through them. Thank your heavenly Father for all the things He is done…not just for you but in our world. And sometimes it means praising Him in the difficult times as well as the good times. Pray for specific needs…yours, loved ones, community, nation, world, missionaries, churches, Israel…the list is endless. And here is a friendly word of caution: please don’t become devoted to the habit of quiet time, but rather, become devoted to the One Who is the object of your quiet time….JESUS!! I found a beautiful song about Mary’s heart by CeCe Winans, Alabaster Box. The words are perfect to close our time together. Click here to listen. Continue to visit when time allows. You have a special place in my heart, and I look forward to our next study together. And please stop by next week. I will post a some Scriptures on what God has to say about His Word and include a Prayer of Commitment you will be able to print off and keep in your Bible to remind you of the commitments and promises we have made here together. And remember, as a member of our on-line studies, you will receive an invitation when our next on-line study is announced. Wendy, this study… like all your studies… has impacted my heart and has deepened my faith. Thank you for the gift of you. I will comment more later, but just know that I am dancing on the mountaintop with your upcoming release date! I love you so much! I also love the title and cover. Love being a member of Wendy’s street team sharing a sisters book to expand God’s kingdom. This study has again reminded me I am so like Martha trying to be Mary. Sitting at Jesus’ feet is the best place to be. But often times life gets in the way which makes me have to start over in reevaluating my time and schedule. Regardless of how long I sit and talk with my father it never seems to be enough time. The one thing I have done when I need to feel closer to Him is to hold my Bible in my arms and hug it, that is my way of hugging God. I used to be so unorganized ( still working on it) but one time whiile I was trying to figure out which bible study to read and focus on, I asked God and it was as clear as day the answer… “The Bible is all you need.” It was so clear I had to stop what I was doing to acknowledge I had just heard from God. I have heard that same thing before as I have searched for a devotional or personal study material! I learn SO much more when I study from the Word directly rather than a devotional or topical book that brings in the Word. Although I know there are times and seasons for everything. And I love that you hug your Bible!! Thank you for blessing me and all the other ladies with this study!! I have so enjoyed it and look forward to the next one!! You have helped me remember not to beat myself up if I become distracted during my quiet time (which does happen if my son gets up earlier than ususal!) God IS NOT mad at me and I can just jump in again tomorrow or later on if I can. That is so freeing and does take away any anxiety I might put on myself!! It frees us up to really RELAX before Jesus and savor the time we spend with him!! Blessings to all of you!! Amen to that! It is so freeing to know there are no rules…God just wants to be with us so we can learn from Him and about Him! I look forward to our next study as well!! Wendy, congratulations on the Bible Study being published. I have done a couple of these on-line studies with you and think it is great that you now have this opportunity. Congratulations! Thank you, and the Lord, for the timing of this short study on quieting my anxious heart. It came at a time when I have been (and still am) struggling with the possibility of losing my vision or some part of it. This study has helped me over these few weeks. Becky, I am so thankful the Lord has used this study to speak into your circumstances. I pray for Jehovah, Jireh, God the Healer, to do a mighty healing work in your body, specifically your eyes, and restore everything back to perfect working order as He created it to work. Please stop back by and update me on your eyes. And I hope you will join us again for another study. Exciting times Wendy! I agree with Noelle…I love the cover, the title and after participating in last fall’s “So That” study I love the message!! Asking God to guide you as you put marketing plans together, to take care of all the details that have to happen between now and the release and most importantly praying He will prepare hearts and minds to receive all He has to say! Also trust He will bless your obedience as you walk in faith and do what He’s called and equipped you to do! I’m also praying He will guide and direct each one of us now that this study is over…this series has helped keep us accountable, so I pray He will give each one of us a plan. Ladies, I’d like to suggest a possible option…Wendy has all of her previous studies listed at the top of her blog and you can go back and work through them or purchase her Proverbs study at P31. Personally I’ve found having a plan and some structure helps me. Jill, first thank you for the prayers for me and for our girls in the study. I also appreciate the wise words you wrote about having a PLAN!! Trusting God will lead each woman to the perfect study for her. So kind of you to share about our other on-line studies and the Proverbs Study. Can’t wait to come see you and the women of your church in a few short months! I know you hear this from me all the time, but I’M SOOOOOOO EXCITED! March will be here before we know it. I can’t wait to share this with my friends and family. So hoping by then I can once again host a Bible study in my home, kicking off with So That, hot off the press! That says it all. It’s not about checking something off our to-do list, it’s about building our relationship with the One who matters most. Once it becomes something to get checked off, we need to check our heart instead. Ok, I’m running back to work now. Love you! Thank you for being so excited for the upcoming publication! You have been such a help to me getting this web site ready for the publication and marketing process. Thank you soooooo much! Wendy, it’s so exciting to see it in print! Your so that study was one of my favorite, and so applicable for today’s life challenges! I also love the series title inscribed, that is what you, through God’s grace, have done with His Word on my heart — thank you! You are so welcome! I love hearing that Living So That touched your life. Satan loves to fill my mind with doubt as I await the release of this book in March. So your words speak truth to combat his lies. Thank you! I’m going to miss this study so much, but, it’s hardly the end. I’m looking forward to continuing my quiet time; and I’ll be checking your blog and will be joining your Street Team. So, there is much to look forward to! Congratulations on your release date! I know that you will continue to be a blessing to many through your new book. Greene is my favorite color; so, I, of course, love the cover – it’s rustic chic, which is just my style. And I love that the series will be easily identified by the logo. I thank God for you. Thank you for providing such a loving foundation for me and so many others. It means so much to know that you will be continuing your quiet time! And I’m so excited that you are joining our Street Team! I can’t wait till we get moving with it. I love the cover. Congrats on getting printed. I didn’t get to do that one, so I look forward to doing it when it’s out. Thanks for all the work you’ve done on the Mary/ Martha Bible study. I have really enjoyed it. Thank you!! I will keep you updated on my blog about how to join Melissa’s on-line study for Living So That when it comes out. GREAT cover!!!!! I think this is so awesome!! I can’t wait to get my hands on this Bible study!!! That makes me feel so good!!! Thank you. Love, love, love the cover. Thank you for making this possible, Wendy. Can’t wait!!! Thank you! And I love leading these on-line studies. I am always sad when one ends. Congratulations on the Bible study. I love the cover…….simple design for an awesome subject. Yippee! I Love the INSCRIBED cover and I am SO excited that it is so the way! Staying in the Word is the best way to INSCRIBE the ways of Jesus on our hearts and keep us walking in HIs LIGHT! This Bible study has once again, been so awesome Wendy. It has brought …1 JOHN 2:6…to mind often. He who says he abides in HIM ought himself also to walk just as HE walked. The only way for me to walk and abide in HIM is to stay in the Word. Your studies are so helpful in that regard and I appreciate you so much. I am excited and eagerly await INSCRIBED!!!!! Thanks for all your comments about our Logo and branding. They will make our marketing people so happy!! I eagerly await it with you. I do also love the cover and title Wendy – so excited to see this come to fruition! This last few weeks has been fabulous and I’ve been just letting God lead me to what he wants me to do during quiet time. Sometimes it means sitting quietly outside on the porch, other times in prayer and still others in the Word. I have been finding myself better with the ‘listening’ part thinking about Mary. So last week, I was actually on the treadmill and listening to gospel music when I got the message that He was urging me to start a Bible study group. To back up, right now I am going to a morning play time at the church with a group of women and kids and I have enjoyed it so much, especially meeting the women and sharing the Christian books and recent Bible learnings we have been independently working through. I had just left it and was thinking about how great the conversation has been and I was sad that this group will come to a close in June (and I have to return to work in September). I soon felt God urging me to reach out and see if some of the ladies wanted to get together for a Bible Study in the fall. In the past, I would sometimes ‘feel’ this guidance but dismiss it after thinking it through – I know now that if it coincides with His Word and teaching I need to go for it and not let Satan confuse me! So I did send an email out for what I am calling an “authentic” Bible study where we can be real and share our challenges, experiences, successes hopefully working through some Proverbs 31 books and now your new one! So I’ve had 3 people respond and I’ll be honest, I’m freaking out a bit now. I remember reading about your efforts to initiate a bible study in your book so I’m asking for prayers. I am certainly not qualified to be teaching a study but I do have a bit of experience with facilitation and I’m going to be relying on God’s help BIG TIME. Praying this all comes together and that somehow He can work through me. Lori, how wonderful that God has called you to lead a Bible study. Walk confidently because He promises to EQUIP those He calls. He will equip you with all you need. I pray Christ confidence will fill you from the top of your head to the tips of your toes. I pray He will give you the words to speak and that He will draw each woman He is calling to join you. You will be GREAT!! I am so excited. Your words are such a blessing!! Congrats, Wendy! The cover is absolutely beautiful! Wendy, this has been my first study with you & it has impacted me greatly. I hope to do more studies with you in the future! An amazing thing about this (at least to me): my Internet is not always good, but when I go to listen to your videos The Lord blesses me with good connection! The cover of your book gives me the feeling of renewal. The title & green color remind me of new growth in Springtime! I look forward to reading it! Thank you for giving of yourself & your faith! Cathy, I’m so excited you enjoyed your first study so much! And i do hope you join us for more. And how cool is your story about the videos…God cares about our every need.! And thank you for the kind words about the cover!! I’m so glad I’m not tasked with designing a cover because I would be at a complete loss, staring at a blank canvas. Whoever did yours captured things perfectly. The font /script make it feel like a personal note to me that makes me feel not so alone in the messiness of my life. The green reflects a good combination of soothing, peacefulness and a sign of rebirth/renewal. And the light bulbs…makes me think of a basement or attic…and shining light into the hidden places, the messy places, the places we keep out of sight from our guests. Although I have a sneaking suspicion that the contents of the book & getting closer to God through His Word will have me thinking those light bulbs are strung up at an old-fashioned community event at the dance hall. Congratulations on “living so that” and your new endeavor with inScribed. What a wonderful blessing both will be to all the women out there. I’m looking forward to hearing more. Wow! I love all your words of encouragement about the cover and will share them with Thomas Nelson’s marketing team. It will mean so much to hear this even before the book comes out. I hope you will join us again for another study. Oh, Laurie, I wish you all could come sit in my kitchen too!! I have so enjoyed getting to know all of you through our long distance study. Thank you for is study an for being available for God to use you, I know He has spoken to my heart though this study and I’m sure I’m not alone. Congrats on the release date and cover preview, how exciting! Rachel, I love what I do. You all have made it richer and better than I thought it would be. Wendy, Thank you so much for this bible study…I have been reading every day, journeling, praying, listening, becoming more like Mary..I totally love it. Congtratulations on the publishing of the bible study—I have joined the “Street Team”, and I’m so excited for what is to come…. I love the cover! I was looking at it and thought—-the strands are our journeys in life and the bulbs are Gods light, where He meets us–between each journey…. Anna, it truly blesses me to read your comment and hear how you have been reading, journaling, praying and listening everyday. It is why I did this study!! And thanks for joining our Street Team! I can’t wait till we can pull you all in. Well…I am sad that our bible study is over. I really enjoyed it! I enjoyed seeing you speak on the videos as you have a good way of relating to your audience. I will miss reading all the comments and conversations between us girls too. And I thank you for a well put together study. It did indeed help me realize how important it is to spend quality time with the Lord each day. He has been finding subtle ways to drive that message home to me as well! Congrats on being published. That’s an awesome accomplishment. May God continue to bless you Miss Wendy, and I look forward to more online studies of yours in the future. And to all you bible study girls I look forward to “commenting” with you in the future too! Beth, thank you for all your kind words of encouragement. God brought together such a wonderful sisterhood of Bible study girls this time. I too will miss everyone! Glad you like the cover. It’s fun to hear everyone’s thoughts. Makes me excited!! I look forward to studying God’s word with you again too. I love the cover and love the fact that Thomas Nelson is doing this. I can’t wait to read it and see what God opens up in my life through your study. You are wonderful teacher and speaker and I have enjoyed all your studies. Praying for God’s will to be done and can’t wait to see how many lives are touched through the Inspired collection. Can’t wait to read the chapter, it is an honor to be on your street team. Crystal, excited to have you on our Street Team!! I too cannot wait to see how God uses this new collection of books by Thomas Nelson. It is such a great idea to bring together a group of women authors and Bible teachers to collaborate together on books to take women deeper into the Word and heart of God. The cover of the new bible study book reminds me of a personalized debit card! Don’t really know why, but every time I swipe, God’s word is more and more inscribed on my heart! This study has been just that for me! I have had hours of being able to sit in the comfort of my home for the past 2 weeks and absorb! I am a 4th grade teacher and have been out of school for 2 weeks now! What a blessing this has been to me! I will look so forward to the new study and am already praying and making plans to open my home to a small group of women that NEED a “girls’ night out” that doesn’t revolve around Mexican food and margaritas! Thank you and God Bless you for sharing your talents with us! Oh ya, would love to see a panoramic of your home, kitchen, etc. I can tell by watching you in video that your taste is superb! I love stuff like that! I wish we could all gather in my kitchen!! We at P31 love to hear how God uses our devotions to draw women closer to God and to His Word!! And I am especially thankful He used a devotional to bring you to us! And, Amy, it’s fun to have you use the word “messy,” since we have it in the title and want it to speak into the lives of moms just like you. I can’t thank you enough for the time you put into writing and doing these studies! I have grown so much as a child of God. I know I have a very long way to go but I know I am on the correct path! I have grown so much during this study. Thank you Wendy! I went to a Ladies Bible Class luncheon yesterday and was so happy to hear other women had also participated. I am looking forward to your study “So That” debut too, and plan on recommending it as a group study to my LBC co-ordinator. I signed up for Wendy’s Street Team and am praying the input is all God driven, and I know it will bring so many into His Kingdom “so that” we can meet someday. May God bless you and your family so you may continue to do the good works He has set before you. Yanna, over the past few studies you have been such a blessing… sharing your words of wisdom and prayers. I know I speak for so many in our study when I say thank you for the time you have invested in each one of us! Thank you Wendy. Love feels so good. 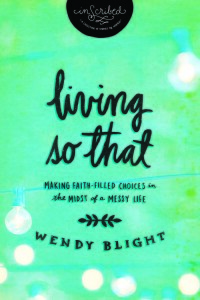 My favorite part is your name Wendy Blight because God brought you from out of a pit so that you could share your unfailing love for Him and give a testimony to God’s faithfulness in all circumstances and through all circumstances. Prasie God for Who He Is. So That is such a simple phrase that pulled me in to the Word even now when I see or think the phrase “So that” I follow through with what has God planned in my life so that I may glorify Him. Wendy CONGRATS…..ON YOUR BIBLE STUDY BEING PUBLISHED SOON! The cover looks good! The more time we spend with Jesus, the less anxious we will be!!! I love the cover- and it sounds wonderful! Can’t wait till it comes out! Loved this study Wendy and started reading your book. Love it too!! I am so excited for you that you got your Bible study published, can’t wait for Melissa to have it as one of her studies!! I will be there when she does. The cover is great!! The color is so bright and cheery. Thanks so much for your insight in this study. I am going to check out your other ones in the Bible study section. God bless you Wendy as you follow hard after the Father and His will for your life. ♥♥♥ You are a blessing!!! Janet, I too am excited to partner with Melissa for another on-line study. It is tentatively scheduled for March 2014. Don’t want to ever wish time away, but I can’t wait!!! Wendy, I have been doing the study but have not been able to post. With our work and the long hours, doctors appointments and then getting laundry done, foods prepared for our next 4 day shift, grocery shopping, etc….the list goes on, but with that said, I have just been terribly busy. I loved this study. Each week before I answered the questions, I read the Bible references and then just spent time thinking about what I had read. Like everyone else, I had read these verses many times before but this time, I knew God was calling me to “reflect” on what I read. It would be 2 to 3 days before I answered the questions, because I was living the character of these women. I tried to place myself in their “time” and feel the feelings they felt. We know that religious leaders were mostly men and these were devout Christian women living in a “man’s world”. I could imagine the feelings they felt toward Jesus and being some of the few that realized that he was the Promised Savior from God. I felt so changed and saddened when it finished. But, I experienced God in a most unusual and unique way. I love the book cover. The color and the fonts are “all woman” and when I saw it, I literally smiled. Perfect, Perfect, Perfect. And we know the transforming knowledge that will be behind that cover. Congratulations and I am so happy to be a witness of a dream coming true. You have been a faithful leader and teacher and God sees what you do with the gift He gave you and now your reward is much. Thank you for sharing your knowledge and love of God with us. Char, thanks for sharing how you approached this study. Putting ourselves in the circumstances and times of the stories we are reading really helps to bring them alive. It helps us see better how they apply to us. Thank you for this study Wendy, and congratulations on your study coming out next year! This study was definitely eye opening. It showed me my Martha ways and how/why I can be more like Mary. I’m working on refining my quiet time. I’ve been doing it for a few months now in the morning, reading devotionals and scriptures. I’m looking forward to growing during this time. Thank you again! Briana, I pray God continues to refine and deepen your prayer life and your knowledge of His heart and His Word as you spend more and more time with Him. Thank you, Wendy for sharing this bible study with us. I have loved every minute of it! I am such a Martha, so driven to get it right, to please God by the things I do, and in all honesty I struggle with the line between showing my faith by my works and trying to work my way into His approval. And I know this is to do with me and my anxious heart rather than anything God expects from me. Being more like Mary, now that is going to take discipline as you say, but your study has helped so much to lay a solid foundation. Again, thank you. Now: The cover of your book is beautiful, and I am really looking forward to ordering it when it is published. The color is soothing and the lights cheerfully invite one to look inside. Thanks for the great comments about the cover. I am sending them all to Thomas Nelson, and I know they will love hearing what you girls think! I too am a Martha and continually have to pray and discipline myself to not let my schedule and my busyness crowd out my quiet time. It’s nice to know we are not alone. Love the cover of your book and can’t wait for it to come out. I am definitely interested in digging into the INSCRIBED books. I have a hunger to know God more and participating in this Bible study has helped me! This is my first Bible Study with you and I have loved it! Can’t wait for the next one! I want to be with other women who truly desire to know and love God with all their hearts! God bless you. Stephanie, it’s so fun to make new friends. I pray for every woman the Lord draws to our studies! I’m thankful you want to return for another study and look forward to studying God’s Word with you again. Thank you so much and prayers to all who have joined in. Congrats on your cover and new bible study! Oh Wendy.. where do I even begin? I am stunned anew every day by the beautiful ways that God has fashioned you. Your multi-layered soul reflects your true love for Jesus.. and God makes Himself known to all of us in the most beautiful and transforming ways by speaking through you … whether through your words, your actions, your contagious love for His Word… or through that undeniable sparkle in your eyes which is such an organic testimony of your joy found in Him. AND I am SO excited for your release date!!! Oh gosh … just to imagine ALL of what God has planned ..!!!! The faces, the Bible studies, the life transformations, the timely and perfect insights.. the enduring and eternal things that He is weaving (and has already woven!) through your So That study… I mean, it’s just mind blowing and faith building!! My smiles, my gratitude, my love for you… pretty much it’s all sapping out all over the place as I write this 😉 and I’m thanking God endlessly for the gift of you ……!!!!!!!!! Sas, I love you back!! Your words bless me more than you will ever know. I am so thankful you have been well enough to join us for this study and am believing God will continue to strengthen and heal so you can join us for every single study!! Thank you Wendy for this study! I know God lead me to this study during a very difficult struggling time for me to remind me to be still and let him restore me. I have been so blessed by this study. I thank the Lord for you. Congrats on the new Bible study. Angie, may God continue to be the Strength of your heart and your Portion forever as you continue to seek hard after Him. And may His indwelling Spirit of JOY fill you with all its fullness as God restores all that has been lost or broken. I have really enjoyed this study, I use to be so close to Jesus but through the busyness of life have somewhat lost that closeness. I still beleive and trust, but just don’t feel that closeness with him. I so dearly yearn to have a deep close relationship with Jesus. He is my best friend and though others befriend me and then drift away I know he is always with me. I know I need to seek him more by sitting still in his presnce. Thank you so much for this study and helping me to reach out and touch Jesus . Peggy, God promises that when you seek Him with ALL your heart, you will find Him. Praying you know the FULLNESS of this promise as you make time with Him a priority. I like the cover I have done this study also and have enjoyed ti and evry time I read the bible and see the word so that, I am reminded of this study. I have not missed a day in my bible and spending time with God since started this bible study. Thank you for your obedience as God spoke to your heart to create this study. It is truly been a blessing for me. I love the cover and title. Look forward to being a part of this bible study and many others from you. Headed to State Tournament in Raleigh!! Thank you for your prayers!! Praying for a BIG win for South Mick High School, our boys and our coach. Will let you know what happens. Play tonight at 8 and tomorrow at 2. If there needs to be a third game, it will be at 8 tomorrow night! Praying for safe travels! Go-Fight-and kick the other team’s booty!!! Exciting! State tournaments are always a joy! My husband, oldest 3 and me are at a Teach Them Diligently Conference…in one way or another every message is connecting with this study!! Abiding with Him is so important!! Pam Tebow’s closing words tonight, “Don’t do ANYTHING apart from God…you must abide in HIM!” Praying we all keep seeking Him and don’t quit pressing on!! Wendy-I can not express to you how much this study has meant to me. You will never know the difference it has made in my life in such a short time. Thank you. I also appreciate how you laid out a “sample quiet time,” that is something I know a lot of people will appreciate. I look forward to your next study and the upcoming book, it looks beautiful. God bless you, and happy weekend. Emily, thank you for letting me know how much this study mean to you. it encourages me as i write another study!! Oh, I love that the colors on the cover made you feel “peaceful.” That is what I pray each woman will feel as they see it on the shelf and will be drawn to it!! Love making new Bible study friends and can’t wait to join you again to study God’s Word. I loved this study. Going to the word without depending on devotionals has been fantastic. I am truly sitting at his feet. I am more like Mary then Martha but I was missing the intimacy with him through his word. I know now that I if I do a devotional it will be my desert. Love the book cover. Can’t wait for it to be released. Mary, what a great way to describe a devotional….dessert!! Thank you for sharing. Sweet friend, I LOVE the cover!! Whoohoo! How exciting! And, I have loved reading the comments from the other girls. With school almost over and senior high shoots slowing down, I am breathing again. I so wish that I could have participated in this study with y’all. I know that it was a blessing to all who did. Would love to try and do a lunch date with you this summer….start looking at your calendar. Love you bunches! Susan, can you believe our kids have finished their second year of college??!! Are we old? Lauren returns from New Zealand and Australia Friday and I can hardly wait. Thank you Wendy for an inspirational study and many congratulations on your new Bible Study. Love the design and color scheme and the logo is quite eye catching. I hope I will be able to find it in bookstores in the UK! Thank you for your prayers for our South Meck Baseball Team!! They won it all on Saturday night in Raleigh. They are the State 4A Champs!! Bo and I drove down for the weekend. What an amazing journey this team has had! Coach Jon was there for every game. Well apparently I did not learn much, my heart is anxious. Who won??? Who won the book? Congrats to the team. Will announce tomorrow on my new blog post!